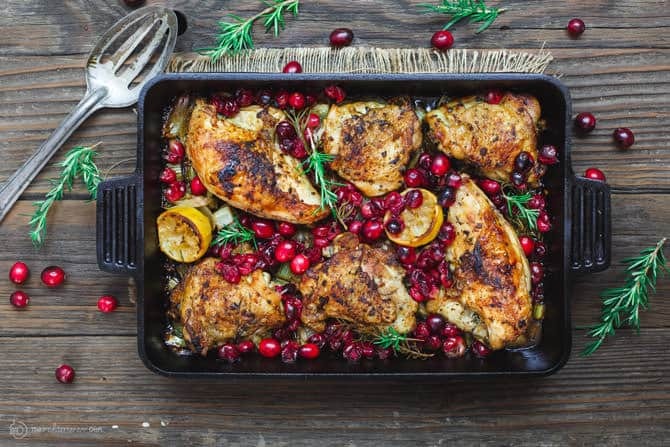 There is nothing better in my book than a simple one-pan baked chicken. All the comfort with little work. 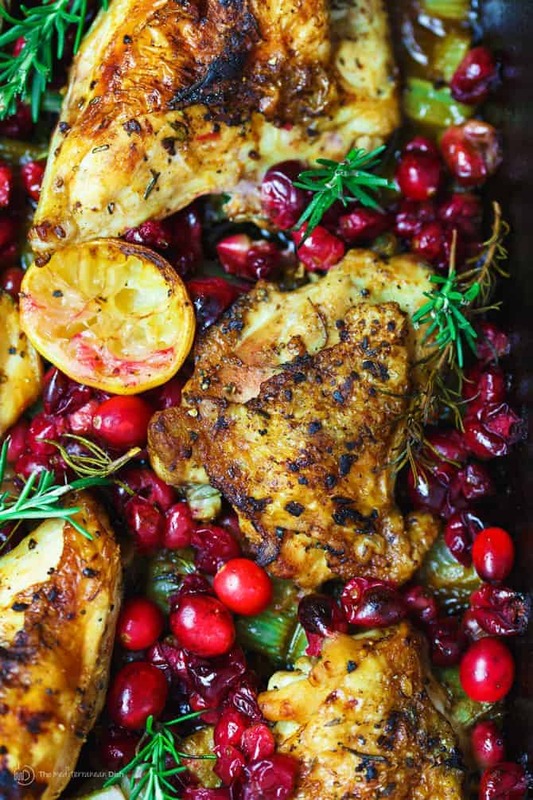 And that’s what we have in today’s easy garlic rosemary chicken…except with an added festive twist using cranberries! This roasted chicken is both super tasty and show-stopping. Step photos show you how to make this easy rosemary chicken! Every cook should have several chicken recipe in her arsenal. In fact, more than one rosemary chicken recipe is even better, right?! Time for a confession. I was craving this easy rosemary roasted chicken and potato dinner, when I came up with today’s recipe. 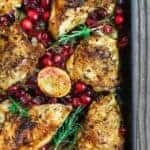 But upon examining a bag of cranberries that sat idly on my kitchen counter, I decided to take a more festive direction and create this garlic rosemary chicken with cranberries. So here we are! Why this Rosemary Chicken works? The flavor stars here are decidedly Mediterranean: garlic, rosemary, and citrus. First, lots of garlic and fresh rosemary and a little paprika make a simple rub for the chicken. Then, for just a few minute, the rosemary chicken sits in a marinade of citrus and olive oil with onions and celery. As far as the role of the pretty cranberries goes, I did not even go to the length of making a cranberry chutney as I have for this lamb recipe. But to “break” the tartness of the cranberries, I mixed them with brown sugar and a hint of white wine vinegar and let them marinate for a bit. Once baked with the rosemary chicken, the cranberries make an excellent, juicy, and even slightly sweet topping. Plus, festive! Can I use boneless chicken to make this? For those who much prefer using boneless chicken, you absolutely can. Christopher, one of our readers tried it with boneless chicken. Here is what he recommends: bake 26 minutes in the oven after browning the chicken pieces for more like 3 1/2 minutes on each side. 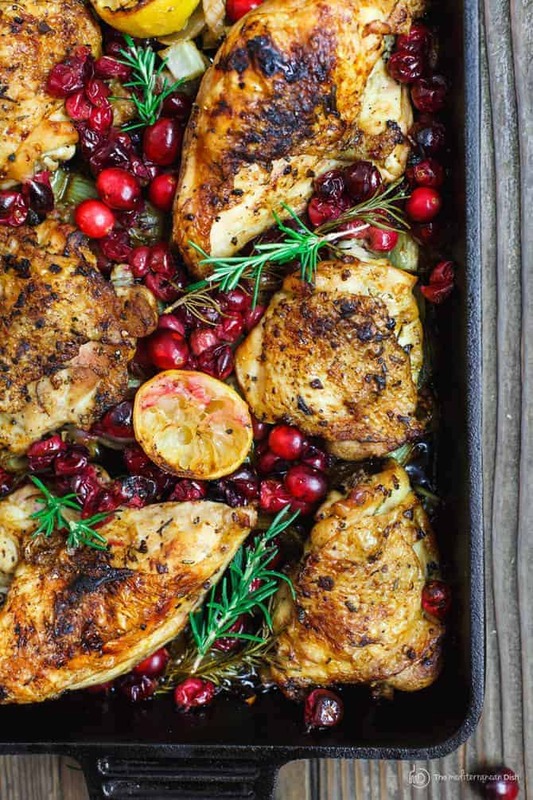 Showstopping rosemary chicken roasted with cranberries. 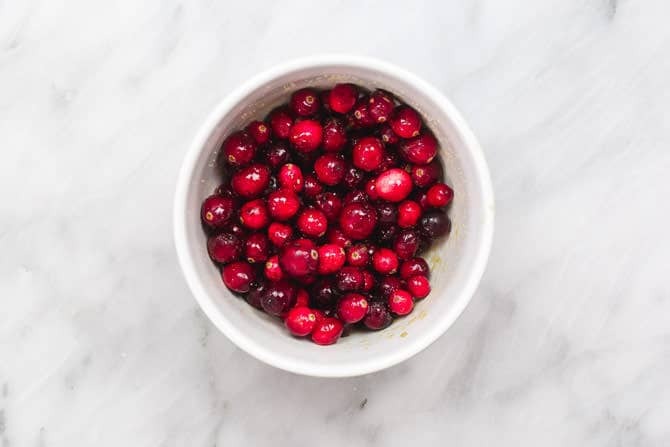 In a small bowl, combine the cranberries, brown sugar, and white wine vinegar. Set aside for now. Pat the chicken pieces dry. Rub the chicken with the minced garlic on both sides (make sure to apply some of the garlic underneath the chicken skins). Season well with salt and pepper. Combine the rosemary and paprika then apply to the chicken pieces on both sides and again underneath the skin. In a large bowl or deep enough dish, mix the olive oil, lemon juice and 2 tbsp white wine vinegar. Now add the chicken, celery, onions, and used lemon halves. Work everything together with clean hands. Set aside to marinate just for 15 minutes or so. Heat 1 tbsp olive oil in a skillet. Place the chicken skin side down to brown on medium-high for 5 minutes. Turn over and brown on the other side. 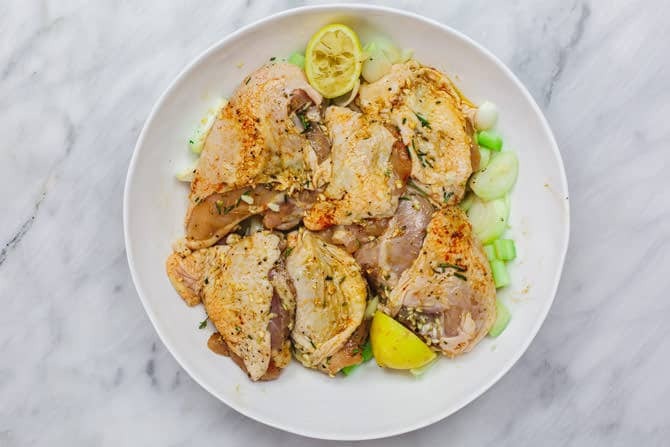 Place the chicken, onions, celery, lemon halves and any liquid from the marinade in a lightly oiled baking pan likethis one. Add 1/2 cup water or chicken broth, then add the sugared cranberries. Bake in the 425 degrees F heated-oven for 35 to 40 minutes or until the chicken is fully cooked through. Serve hot with Lebanese rice and your favorite salad. Cook’s Tip: For those who much prefer using boneless chicken, you absolutely can. Christopher, one of our readers tried it with boneless chicken. Here is what he recommends: bake 26 minutes in the oven after browning the chicken pieces for more like 3 1/2 minutes on each side. – This recipe produces way too much liquid, I suggest reducing chicken broth to 1/3 of a cup, otherwise the chicken boils in the liquid. – I substituted a very high quality apple cider vinegar for the wine, because of personal preferences. It turned out beautiful without the wine. – I prepared this 5 hours ahead, pre-cooking everything in batches (chicken thighs to 150-degrees), loading 15 thighs and everything else in two baking tins, and finishing it off to an internal temperature of 165 before serving. – I used whole, frozen, unsweetened cranberries, because fresh is not available this time of year. I mixed the brown sugar, vinegar and cranberries several hours before to let them marinate and thaw. I’m planning to make this tomorrow, but don’t have white wine vinegar…..I have regular vinegar, apple cider vinegar, or Chardonnay! What would you recommend as a substitute ? Hi Mandi, chardonnay would work better if you’re looking to substitute the white wine vinegar. Suzy! I made this for my Christmas dinner centerpiece and it was beautiful, delicious and loved by everyone. Thank you so much! My wife strongly prefers only to eat boneless chicken, so I used 26 minutes in the oven after browning for more like 3 1/2 minutes on each side. Also, I had pulled my cranberries out of my freezer, so I let the marinade a little longer in the sugar and vinegar so they could thaw as well. Very much worth the little bit of effort and perfect for a holiday dish!! Christopher, thank you so much for sharing! I’m going to add your note re using boneless chicken for those who prefer! Made this for our Christmas dinner! Oops just like your picture and oh so scrummy! I’ll definitely make it again but I think I may up the brown sugar or cut back on cranberries! The smell of it cookies was amazing! Thank you for,this delicious recipe! Wondering how long I would cook if I double the receipe and substitute skinless boneless chicken? Thank you in advance. Looks delicious! Hi Avid, it really depends on your oven. The rule of thumb is that the chicken’s internal temperature needs to register at a minimum of 165 degrees F.
Can I marinate the chicken night before and leave it over night? It’s not necessary to do that, but you can…be sure to refrigerate the chicken in a non-reactive tight-lid container. The chicken was very delicious and will definitely be making it again. I do have a question about the white wine vinegar though. You indicate 2 -3 tablespoons. Does that mean you use 1 1/2 tablespoons for the cranberries and 2 tablespoons for the marinade? Can I do this with a whole oven roaster?